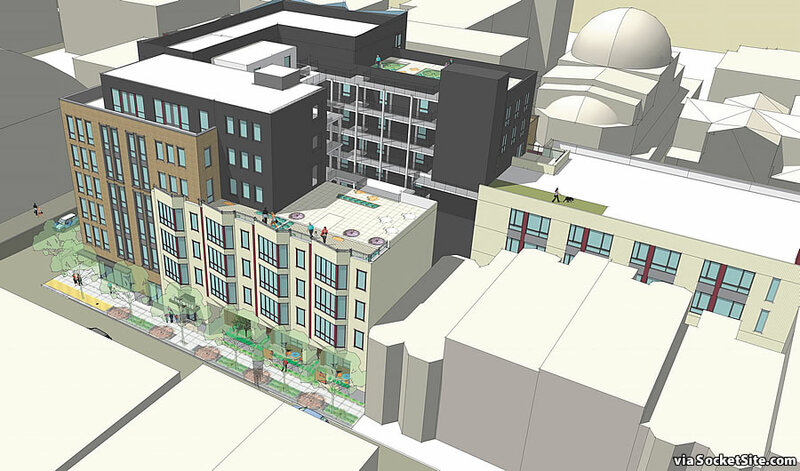 While opposed by a number of neighborhood factions, two new buildings could rise up to 78 feet in height upon the Mission District parking lot parcels across from the Armory on 14th Street. 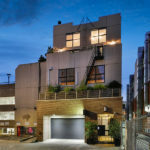 As designed by BAR Architects for Manouch Moshayedi/MX3 Ventures, a seven-story building on the southern parcel fronting 14th Street would yield 56 apartments (a mix of 23 one-bedrooms, 31 twos and 2 threes) over 5,600 square feet of ground floor retail space, secured parking for 57 bikes, and a basement garage for a total of 42 cars. The 344 14th Street building would step down to four stories along Woodward Street with a rooftop deck above. And on the rear parcel fronting Stevenson Street, a three-story Small Enterprise Workspace (SEW) and Production Distribution & Repair (PDR) building would yield 13,120 square feet of SEW over 6,240 square feet of PDR, all of which could be divisible down to individual 250-square-foot work spaces with target rents of around $1,500 per month. 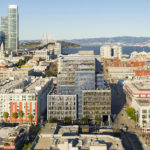 But having determined that, on balance, the proposed development is consistent with the objectives of both the City’s Mission Area and General Plan, and that a requested State Density Bonus would allow for the development to rise above the 58 foot height limit for the site as currently zoned, San Francisco’s Planning Department is recommending that San Francisco’s Planning Commission approve the development, which has been in the works since 2014, this afternoon. 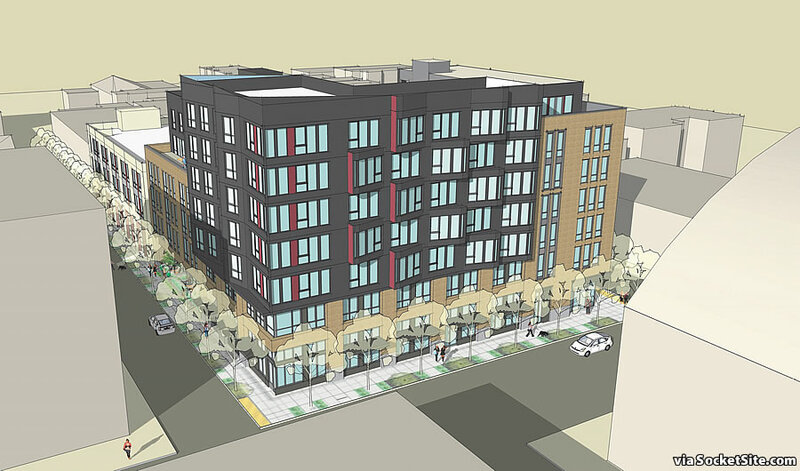 UPDATE: The public hearing and Planning Commissioners vote for the proposed development to rise at 344 14th Street was continued to a later date, for the sixth time, yesterday. We’ll keep you posted and plugged-in. What a wonderful story about overcoming thoughtless NIMBYism. There is hope yet! This development and the other around the corner at Valencia and Clinton should do a lot of good in activating and cleaning up the area. Definitely looking forward to the additional housing stock in the neighborhood. Wow! Great news. So cool. Anyone know if this project required a variance or other exception from applicable standards? If not, the recommendation for approval is probably due to the state’s Housing Accountability Act, which was significantly strengthened in 2017 and which probably also explains the “quiet” approval of the Mission Laundromat project (over massive NIMBY opposition). Very nice, ingenious use of the parcels. I hope it was approved over the usual, reflexive objections though the possibility of increasing the share of BMR should be explored depending upon the economics. 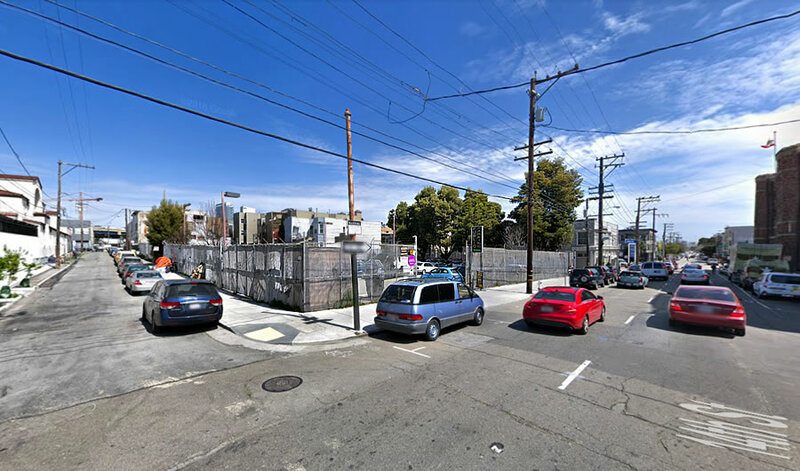 Let’s just hope this stays off of Hillary Ronen’s radar so that there isn’t a last-minute overruling due to her political capitulations to MEDA or whatever NIMBY group is objecting to the destruction of this undoubtedly “historically significant” parking lot. 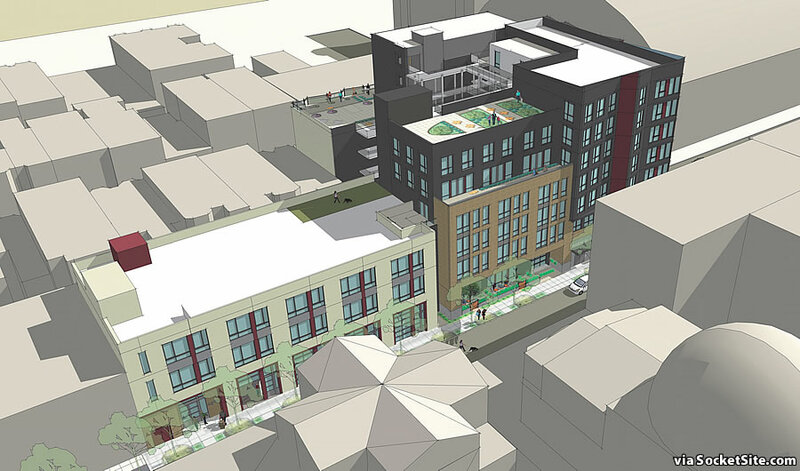 The project sponsor should simply omit the PDR portion from the project — reducing the project to a simple mixed-use residential project and then invoke the Housing Accountability Act along with the State Density Bonus Law. Accordingly, the Planning Commission will not have any legal authority to deny the project and the project sponsor can thereby neutralize the b.s. opposition from the usual NIMBY/Nativist suspects.